Kristen Alfaro is a PhD student in the Department of Cinema Studies at New York University. Her research on the development of Anthology Film Archives has been published in The Moving Image, the Journal of the Association of Moving Image Archivists. She has also contributed to n+1. 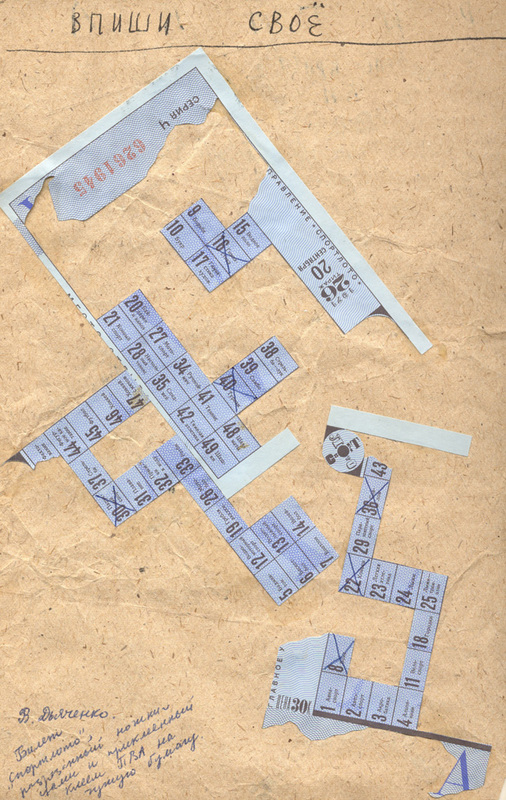 "Write Your Contribution," collage with SportLoto ticket by V. Diachenko, Nomer, No. 30, 1971. Courtesy of the Historical Archive, Research Center for East European Studies, University of Bremen. When Joseph Stalin came to power in 1924, he heightened censorship and manipulation of the Soviet Union’s state-controlled media, including printed matter, photography, radio broadcasts, and television. Samizdat—the reproduction and distribution of censored literature via self-publication—emerged throughout the USSR in the 1950s and was a key component of dissident activity well after Stalin’s death in 1953. Samizdat was both material and system, its networks composed of a committed body of people who published, distributed, and circulated human rights bulletins, literature, art, and poetry. Being an “author” was risky; obfuscatory terms like “editors,” “typists,” and “readers” often marked the pages of samizdat publications. The circulation of a publication depended on its readers, who sometimes took it upon themselves to edit the text before passing it on. Or, as in the case of the Chronicle of Current Events (Khronika Tekushchikh Sobytii, Moscow, 1968–83), readers were also volunteer publishers who would retype the text in order to meet demand and maintain circulation. 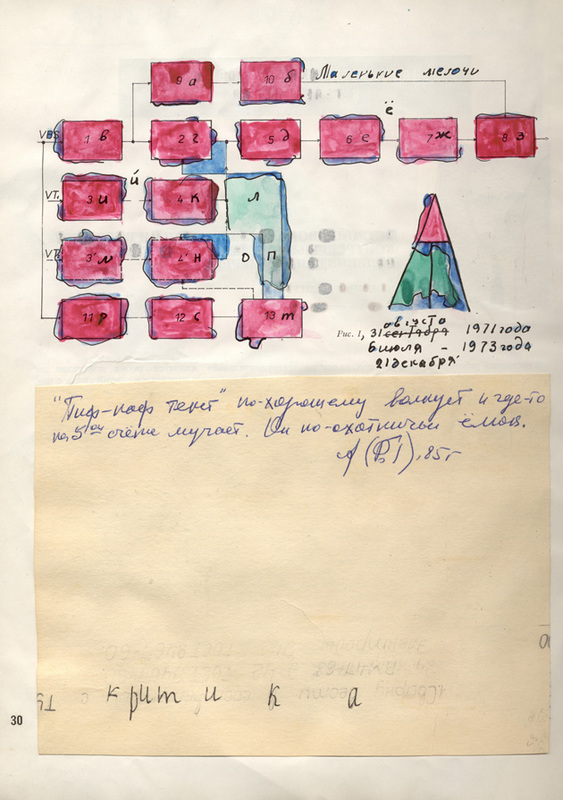 While production remained plural and anonymous, the samizdat object was individualized: Each copy of a copy bears a record of its life among readers. Ann Komaromi is an assistant professor of comparative literature at the University of Toronto currently completing a book on samizdat, literature, and history in the late Soviet era. She is one of the founding members of the International Samizdat [Research] Association and the publisher of the Soviet Samizdat Periodicals database at the University of Toronto Libraries. The database contains information from the Radio Liberty archive and thirty other collections, including three hundred samizdat journals. Kristen Alfaro: Can you explain the variations of samizdat material and form? Ann Komaromi: In the Soviet Union, most samizdat texts were typewritten. People used whatever paper they could get; often the paper was cheap and did not hold up well in the long term. Though not always available, thin onionskin paper offered significant advantages: When used with carbon paper, it enabled the production of several typed copies at once. It was also easily concealed. KA: Who were the samizdat typists? How much authority over the text did the copier have? AK: The designation typist tends to be used for those people, mostly women, who were asked (and sometimes paid) by samizdat authors or editors to produce exact copies of a text. In these cases, fidelity to the original was paramount. But in scenarios where a reader retyped a text independently, motivated solely by his or her own enthusiasm, edits could be made at will. Similarly, works in foreign languages were often altered when translated for samizdat circulation. KA: How did samizdat readers respond to edited works? AK: The most striking case we know of was Leon Uris’s long novel Exodus. It was translated and typed in several different versions, some of which were cut to a fraction of the original’s length. Jewish samizdat readers responded powerfully to the novel as a story. I think they were simply glad to access it in any form. Samizdat readers proved far more punctilious when it came to Russian poetry and literary works. For instance, they corrected mistakes and restored cuts in the samizdat version of Bulgakov’s The Master and Margarita, which was censored in official publication. KA: You write about the typescript as a dissident symbol, a concept embraced and fetishized first by the West and later by Soviet dissidents themselves. When did the shift between typescript as practical medium and typescript as symbol of dissidence occur? What were the changing factors? AK: By the end of the 1960s, once samizdat had become recognizable as a system, people began to mythologize it. The poor-quality typescript came to symbolize the suppression of culture and expression in the Soviet Union, as well as the pursuit of uncensored literature and social thought by Soviet citizens. In February 1971, for instance, Amnesty International launched a reprint of the Chronicle of Current Events, a Soviet human rights bulletin. The reprint included photographs of the original typescripts, which, in their new context, functioned as markers of resistance, uprising, and freedom of speech. KA: I’d like to take a closer look at the Chronicle. It was first published in 1968 by poet and civil rights activist Natalya Gorbanevskaya. How did the bulletin obtain information about human rights violations? AK: The Chronicle often solicited information from its readers, who were asked to pass information back along the chain through which they had received their copy. The editors also established personal contacts with Lithuanian dissidents, unregistered Baptists, and others. Worried about factual errors, the editors warned their reader-publishers to be on guard against them and tried very hard to confirm and report only established facts; they were highly successful in this. KA: Can you describe the different types of Chronicle copies? How did the journal circulate? AK: Due to its unparalleled informational character, the Chronicle circulated more widely than any other samizdat publication. Within the Soviet Union, some copies were produced by the editors, others by the readers. We know that copies were sent through diplomatic mail and press pouches and smuggled into North America by Westerners outside of the USSR, but we are still trying to establish exact channels of distribution. In the West, additional versions were published in Russian and in English translation. Amnesty International took the highly unusual step of endorsing the Chronicle and publishing its English version. Circulation was also facilitated by Radio Liberty, the Cold War anticommunist propaganda channel funded by the US Congress. Personnel would read issues aloud on air and broadcast them back to the Soviet Union. In addition, the Western press and radio relied on the Chronicle for their own reporting. "Pif-Paf Text" with later criticism by Anna Tarshis, Nomer, No. 30, 1971. Courtesy of the Historical Archive, Research Center for East European Studies, University of Bremen. KA: How about other samizdat journals? Did each journal have a particular system of distribution? AK: In principle, samizdat distribution happened in a spontaneous and rhizomatic way. In practice, the distribution of particular journals depended on networks of acquaintance and interest. For example, samizdat rock zines were distributed at music festivals and through the mail. Number (Nomer, Sverdlovsk and Rostov, 1965–74), an “open” journal by the neo-futurist group led by Ry Nikonova and Sergei Sigei (the pseudonyms used by Anna Tarshis and Sergei Sigov), is a special case. For each issue there was only one copy; readers were limited to friends of the editors and were invited to contribute to the discussion by writing, painting, or pasting in their own contribution. The success of the dialogue depended in large measure on the tightly circumscribed network of reader-contributors. The editors then went on to do a larger edition, Transponans (1979–87), which circulated to dozens of readers. Nikonova and Sigei stood out among samizdat authors and editors in their cultivation of the samizdat text as an open and collaborative space. Their work challenges myths around individual authorial genius often otherwise associated with samizdat texts. In a certain sense, they continued the collaborative investigations of Russian futurist books from the early twentieth century but added to them an inquiry into the evolution of a text. KA: Can you say more about the material evolution of the samizdat text? AK: I’d like to invoke the literary scholar Jerome McGann, who, in his book The Textual Condition, describes the irreducibly material condition of our reading, which always implies social and historical relations. For the study of samizdat and its relationship to dissidence, that means we should push our inquiry beyond narratives around censorship and free speech and into the particulars of the social and historical context. Samizdat emerged in large measure from grassroots efforts but, in a number of cases, found itself the recipient of domestic and foreign institutional support. In addition, the political context ensured that only certain types of samizdat reached an international public. Beyond the highly publicized human rights editions like Chronicle, there remains a sizable corpus of social and cultural activity that has yet to be assimilated into the history of dissidence, literature, and art. KA: Accounting for all the permutations in the form and means of distribution of samizdat must present a difficult task for the historian. What were some of the challenges you had to overcome when compiling the Soviet Samizdat Periodicals database? And how will our understanding of samizdat history evolve as access increases? AK: The challenge was to bring together information about different instantiations of samizdat texts. I wanted researchers to have access to samizdat copies wherever they could be located, and I did not assume that later reprints were equivalent to the copies originally in circulation. Finding these copies meant traveling to a lot of archives, many of them small and independent, in places as scattered as Budapest, Moscow, Saint Petersburg, Bremen, Toronto, Jerusalem, Vilnius, and Waco, Texas. These collections hold samizdat volumes that traveled along various distribution networks, including through diplomatic and press mail services, as well as those carried out of the Soviet Union by tourists and visiting scholars. As more and more scholars study samizdat, I think they will uncover a greater variety of texts, including poetry and art, many of which did not circulate widely in the Cold War era. And I expect we’ll have a more precise understanding of the role of the specific individuals and government agencies that facilitated the circulation of uncensored texts in and out of the Soviet Union and Eastern-bloc countries. Overall, samizdat involved risk and commitment on the part of those who wrote, copied, and distributed the texts, and its history highlights the way in which our participation in the life of a text can yield profound and enduring consequences.